Updated September 6, 2013 at 11:10 am: There is an excellent article by Stephen Wickens on his blog recounting the sorry history of Queen’s Park’s imposition of the ICTS technology on the Scarborough route. It is worth noting that the ICTS cars cost over $2-million each 30 years ago, an outrageous sum. The price to Vancouver was much lower, well below $1m each, and the TTC order was used to funnel money from Queen’s Park to offset the development costs of the new technology. This is what passed for a “transit strategy” in the Davis government. Updated September 5, 2013 at 11:00 am: My comments about Transportation Minister Glen Murray’s Scarborough subway announcement yesterday are now online at the Torontoist. The original post follows below. Over the opening weekend of the Toronto International Film Festival (TIFF), King Street is closed in the block from Duncan (aka Ed Mirvish Way) to John to provide additional pedestrian space around the major TIFF events in the area. This will last until Monday, September 9. 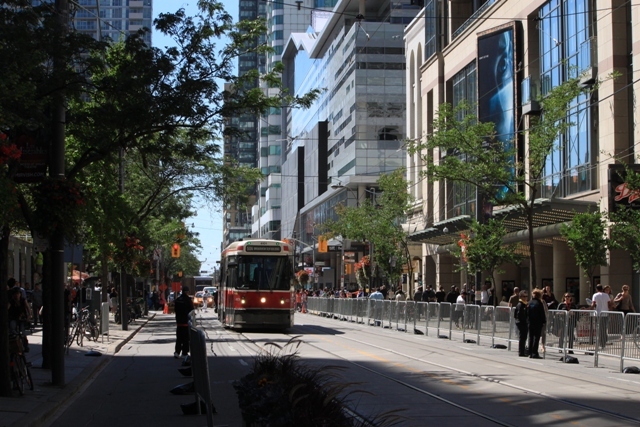 Of particular note, control of access by the streetcars to the centre lanes is handled not by Toronto Police paid duty officers, but by TIFF security guards and festival volunteers. Further east, at the Don Bridge, structural problems that have imposed a slow order on the King Street leg will finally be addressed (now that Waterfront Toronto and the City have sorted out a cost sharing agreement). 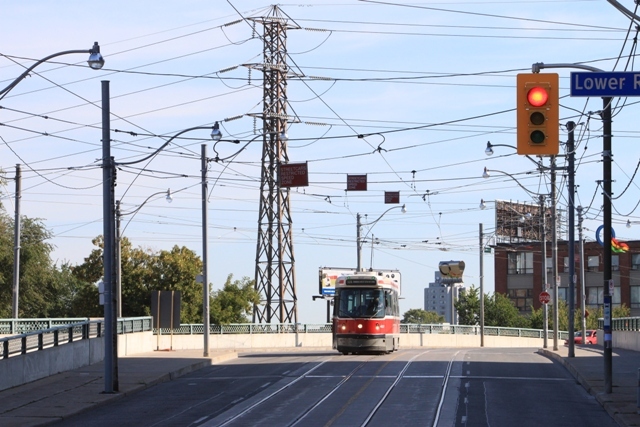 Starting September 9, all 504 King and 503 Kingston Road cars will divert both ways via Queen and Parliament. There will be no replacement bus service on King. The diversion is expected to last until sometime in November. There is no word on the status of the eastern approach to the bridge which also has a slow order on it.